The stars are aligning for Idaho—mainly because they're visible. 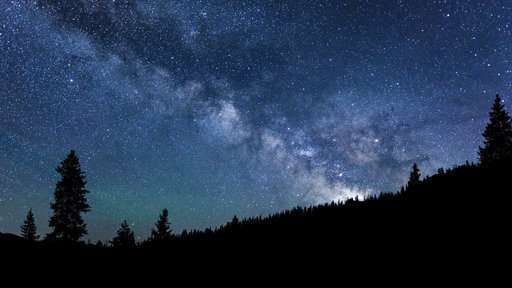 The International Dark-Sky Association this week named the central Idaho city of Ketchum an International Dark Sky Community, only the 16th in the world, after years of efforts to limit excess artificial light. It comes as bigger parts of the state received or are seeking rare dark-sky designations that can attract stargazers and boost home values. Craters of the Moon National Monument and Preserve in south-central Idaho, a prime destination for astronomy buffs, became an International Dark Sky Park earlier this year, one of about 40 in the United States. And the rarest prize of all could come in December when the association decides whether to designate 1,400 square miles (3,600 square kilometers) in central Idaho an International Dark Sky Reserve. It would be the first in the nation. Idaho is "becoming one of the centers of interest in dark skies in the country," said John Barentine, program manager at the Tucson, Arizona-based International Dark-Sky Association. Much of Ketchum's economy runs on tourism, and the designations could bring in additional visitors. Thousands descended on the mountain resort town for last summer's total solar eclipse, and it's sandwiched between the ritzy Sun Valley to the east and Sun Valley Resort's ski area on Bald Mountain to the west, which draws tourists from across the globe. The town's designation is due to the "work of so many who have devoted time and energy to reducing light pollution across our city and neighborhoods so that we can enjoy the truly amazing views we have of the night sky," Mayor Nina Jones said in a statement. Ketchum, with some of the highest home prices in Idaho, is the first city in the state to be named a Dark Sky Community. The association started making such designations in 2001, which also include Sedona, Arizona; Beverly Shores, Indiana; and Moffat, Scotland. Dark-sky measures have drawn opposition in the U.S. from the outdoor advertising industry and those against additional government regulations. The Ketchum designation could help as the International Dark-Sky Association considers a 127-page application for the reserve in Idaho. Barentine said the group looks at what surrounding communities are doing to protect the dark core area of the reserve. "It's more like a restoration effort in the communities, and it's more of a preservation effort in the parks and reserves," he said. Barentine said Craters of the Moon monument is too far away from the proposed reserve to be a factor in the decision, expected in mid-December. © 2017 The Associated Press. All rights reserved.